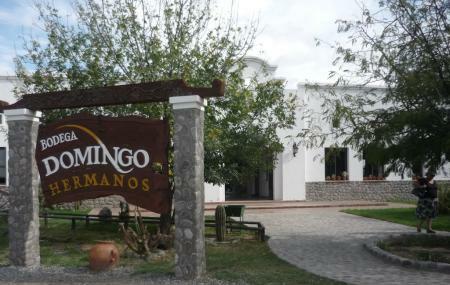 A petite but interesting winery, guided tours available only in Spanish. Drop in for some excellent in-sight on the wine making process! The tour lasts for 01.00 hour. Wine tasting has applicable charges. Love this? Explore the entire list of places to visit in Cafayate before you plan your trip. Fancy a good night's sleep after a tiring day? Check out where to stay in Cafayate and book an accommodation of your choice. How popular is Bodega Domingo Hermanos? People normally club together Museo Arqueologico and Bodega El Esteco while planning their visit to Bodega Domingo Hermanos. value for price balance definitely okay, since the tour costs only 50 pesos including the tasting. Negative for me was that the guide didn't speak any English and after asking to slow down in Spanish, still talked really fast and seemed not highly motivated or considerate of the guests that don't speak Spanish so fluently. On a big Tour, i can respect that, but with only 4 customers taking the tour, that's something to consider. Our guide was friendly, but have the impression only to be summing up a prepared text, with little room for extra info or questions. The tasting was good, 4 wines (2, whites and 2 red ones) and 2 types of cheese, which nu itself was worth the money paid. Overall an adequate tour worth considering, but mostly for native Spanish speakers. We really enjoyed our tour and wine tasting here. 50 pesos per person for a our, tasting of 4 wines and some cheese, which is also all available to buy in their shop. The tour guide was really nice and we were the only ones on the tour at 4.15pm. 3.15pm was much busier probably because it opens again at 3pm. Really relaxed tour and tasting. Really good explanation of the process of wine making. “The roses are there to help the pest control and avoid infestation. We have a really good time with my mum there. They provided some cheese and crackers for the wine tasting. Had a winery tour in Spanish, and didn’t understand too much. But enjoyed the tasting at the end! Took home a bottle of their 2017 Reserve Torrontes and some goats cheese as well :) good value for money! Bodega for more large-scale, industrial production. The tour a 40 ARs is good value, consisting of a 20min explanation and a degustation of 4 wines and 2 types of cheese. We bought one of their goat cheeses, which are pretty nice.